What to do when you’re in Bali and the rain pours down? Walking through puddles of water does not sound like the best thing to do on a holiday on a tropical island! But there are ways to enjoy Ubud, or Bali in general, when it rains like hell. Stay calm: it will most likely not rain all day long! I went to Bali two times during rainy season. The first time I went, it luckily only rained at night whilst the day was sunny. This year was quite the opposite: It started to rain at around 1pm and did not stop until 7pm. It’s important to watch rain patterns whilst you are traveling, as they do not change most of the time. Knowing when it starts gives you the opportunity to plan your day around bad weather. If I know it starts raining at around 1pm, I’ll just get up at 6 or 7 in the morning and do all the activities I want to do in the sun before that. You might now think “I’m on holidays- I definitely do not want to get up that early!”. This totally makes sense, but just go to bed earlier the day before! You don’t want to miss out on a party night? Well, just make a party afternoon out of it. It’s your holidays! Why not enjoy a cocktail at 4pm and go to bed at 10pm? Just reschedule around the rain patterns and you’re fine! Escape the rain in a SPA. They normally offer day packages, where you can spend a whole day inside, get massages, facial- or hair treatments. “Clear CafeJalan Hanoman 8” in Ubud has a SPA area with a restaurant included. It is one of the most beautiful places I’ve ever been to and the food is nice as well! Treat yourself with a good massage and get some healthy food after. Time will just fly past until the rain stops. Just across the street, a little bit further down the road, there is another massage place, which is cheaper and (in my opinion) way better than the touristic spas. It is called “Resik SPA”. Make sure to go to a girl called Wayan, as she is a massage magician!! She fixed my back within an hour and I felt like a newborn baby! Read more about Bargaining in Indonesian on my other article here. Bali is so cheap! You can easily rent a whole villa if you are more than four people and can share the costs. Most of them overlook rice fields and have a nice pool. Once it is raining, you don’t have to worry to get wet anyways. The pictures below were taken in Canggu, but you can also find similar accommodation in Ubud. Just check out AirBnB and relax in your new outdoor living room. Talking about healthy food: Did you actually know how healthy it is to travel? 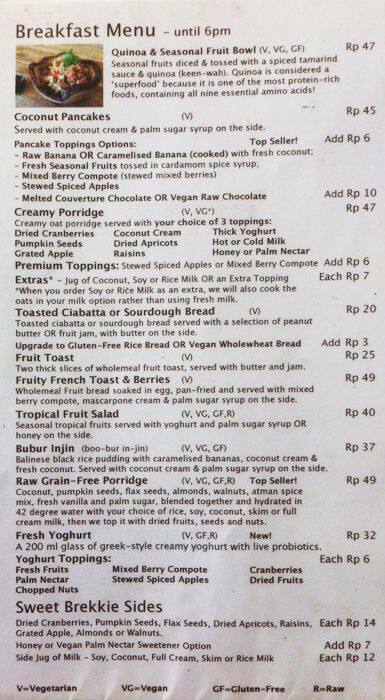 There are SO many options to eat healthy in Bali! Especially Ubud has a lot of different places worth checking out!